always wonder what these hot rods once looked like. at what point does someone think, "i'm going to remove this, insert that, repaint it...," when they have a perfectly good car. 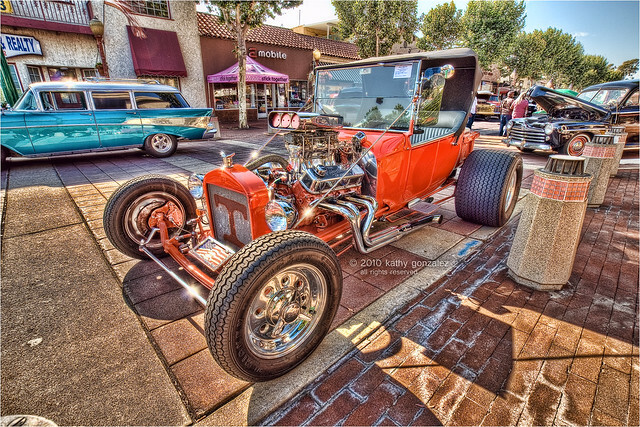 some of these come out great in the end, some have earned the ratrod title. this 1928 ford model t (maybe the owner is just monogramming his initial on the radiator) was pretty well done. has the required big engine thing (wall-E), and i love the added extra big fat tires on the back. i should have done a panorama here - wish i hadn't clipped off the front of the chevy. live and learn.